The new WeatherSTEM monitoring station on the roof of Harold Alfond Hall at St. Joseph's College in Standish. The station is the first of its kind in Maine. STANDISH – A new, high-tech weather monitoring unit at Saint Joseph’s College is already making it rain – data, that is. The college is the first institution in Maine to boast a WeatherSTEM unit, an advanced meteorological monitoring station that constantly gathers at least 15 elements from the local atmosphere – including temperature, humidity and wind speed – and pushes that information to an online database where it can be accessed almost immediately by researchers, students and the public. The WeatherSTEM system, which is located on the roof of the four-story Harold Alfond Hall at the center of campus, was donated to the school by WeatherSTEM CEO and creator Edward Mansouri. St. Joseph’s alumnus and trustee Michael Mulhare facilitated the donation. The system also features a camera looking towards Sebago Lake that provides live 24-hour photos and a time lapse of the previous day. While the time lapse may be getting the most public attention so far, Dorland says that the data gathered by the monitoring unit, coupled with the video, has tremendous potential for researchers and students looking to study how weather affects Sebago Lake, the water supply for the greater Portland area. According to Dorland and Johan Erikson, who teaches environmental and marine sciences as well as chemistry, the data collected by the WeatherSTEM system will allow researchers to better understand the impact that elements such as wind, light and temperature have on the health of the lake. “That kind of quality data enables students and professors to move beyond qualitative descriptions of process, to actually start putting numbers on things, and that moves the education from one level to an entirely different level,” said Erikson. 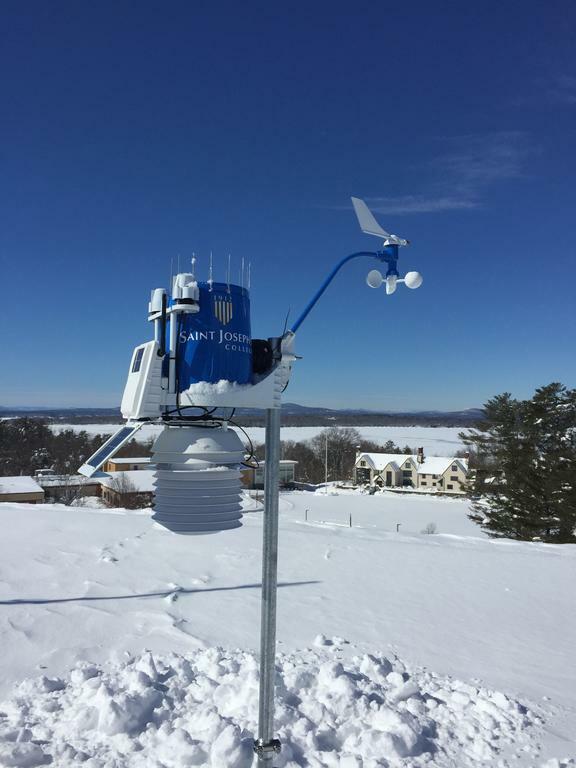 The WeatherSTEM unit was installed in January, just in time to capture data and footage from recent snowstorms that had blanketed the campus. The station also serves as a weather alert system for the campus, with the capability to send notifications about local weather conditions by push notification, text, email, social media and phone. The school already has an older weather station located on the top of Heffernan Hall, but Dorland says the new addition is a significant improvement. The new weather station will bolster a long-term project about the health of the lake St. Joseph’s is working on with the Portland Water District. The college is also in contact with Windham Middle School about using weather data in its students’ course work. Moving forward, Dorland and Erikson expect the new weather station to be used in a wide range of science courses, including physics, senior biology, and research on Sebago Lake. In the past, students have even built their own weather stations to compare their data to the data collected by the school’s older station. They expect those projects to continue, and student interest to grow, with the new station. The new WeatherSTEM monitoring station on the roof of Harold Alfond Hall at St. Joseph’s College in Standish. The station is the first of its kind in Maine. St. Joseph’s College HVAC Technician Mark Tracy, of Hollis, climbs down from the roof of Harold Alfond Hall, where the college’s new WeatherSTEM unit gathers atmospheric data. A screenshot of St. Joseph’s College buried in snow captured by the WeatherSTEM camera on Feb. 14.